I have a confession to make. 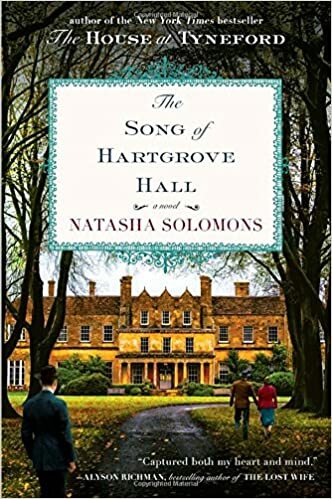 Natasha Solomons's The Song of Hartgrove Hall (Plume, 2015) isn't a mystery. So why am I reviewing it here? One reason is that it was one of my favorite reads of 2015 and I don't think it's received the attention it deserves. Also, because I think it might appeal to fans of Downton Abbey. I know that many of you are big fans of Downton Abbey and may be ready to go into withdrawal as it comes to a close. The Song of Hartgrove Hall, the story of the residents of a big English country house, could help you through your initial withdrawal pains. So, you're welcome! Harry Fox-Talbot is the youngest of three young brothers from Hartgrove Hall, a grand but crumbling country house in the beautiful Dorset countryside once painted by Constable. His story is told in alternating time periods. The early part begins in 1946, as the brothers return from World War II and come home for the first time in seven years. The late part runs from 2000 to 2003. Then Solomons steps back to 1946 and weaves her tale of Harry meeting and falling in love with Edie, a songstress and his dashing brother Jack’s girl. The years go by, filled with their history and that of Fox’s hunting down folk music and turning the songs into symphonic themes. And always, Hartgrove Hall is there, a perfectly beautiful exterior that is, underneath, full of age, damage––and poor heating. The three-year story after Edie’s death tells of how Fox makes a surprising connection with his four-year-old grandson, when they discover together that the boy has a gift for the piano. This nudges Fox back into life and contacts with his family and his old colleagues, with all the bittersweetness of memory and regret. Natasha Solomons has produced another novel that manages to be intelligent and heartfelt, without any sloppy sentimentality. She writes so beautifully that she can make the description of a frigid and windy Russia appealing, even as I sit here on a cold day. The atmosphere and feelings evoked by the story will stay with me, and I know I will read this again. The publicity for the novel notes that it’s from the author of the bestseller The House at Tyneford. I can see why the publisher would do that, since that’s Solomons’s most successful book, but I really don’t think this is much like the Tyneford novel. To me, it’s much closer to my favorite Solomons novel, Mr. Rosenblum Dreams in English, another love letter to England and Englishness, with all the flaws and oddities. Note: I received a free advance reviewing copy of The Song of Hartgrove Hall from the publisher, through Amazon's Vine program. Versions of this review may appear on Amazon, Goodreads, BookLikes and other reviewing sites, under my usernames there. Image sources: Amazon.com, commons.wikimedia.org, natashasolomons.com.